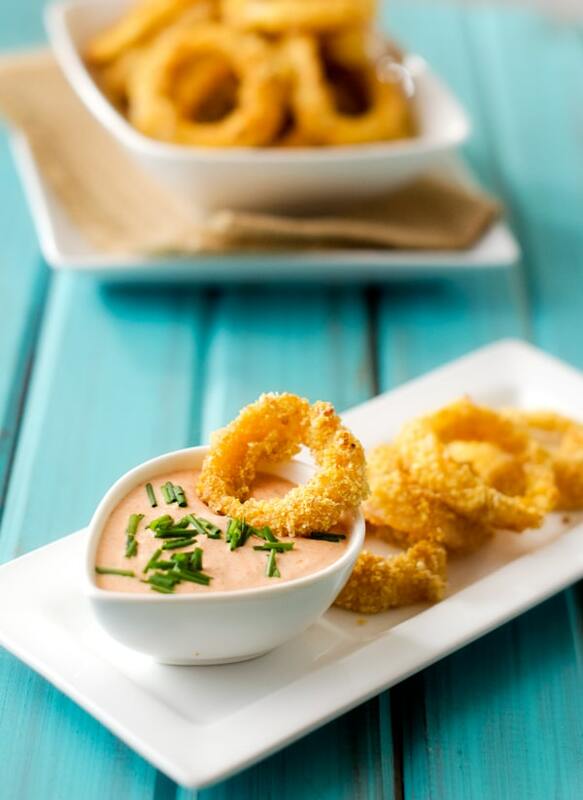 These Healthy Onion Rings are light and crunchy and so delicious! They are the perfect way to get your snack on without blowing your diet. I don’t know about you, but I love fried food. What’s not to love? Oh, yeah, fat. I’m not a huge fan of that or how frying makes my house smell. The good news is that though you can’t replicate frying 100%, you can get pretty close with oven “frying”. So for our Super Bowl celebration we will be enjoying these beauties. 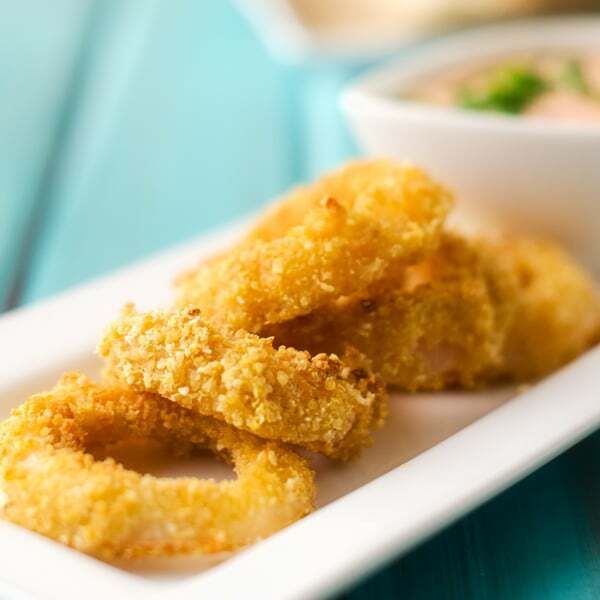 Crispy, crunchy, quinoa crusted baked onion rings. Football food, made healthier. Preheat oven to 420 degrees. Line two baking sheets with parchment paper. In a shallow dish combine quinoa flour, arrowroot powder, paprika, cayenne and salt. Whisk together buttermilk and eggs in a separate shallow dish. Place quinoa and quinoa flakes in a blender and pulse until crumbly. Place in a shallow dish. 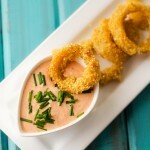 Dredge onion rings into the flour mixture, then dip into the buttermilk mixture. Drain excess batter and dredge into the quinoa mixture. Arrange on the prepared baking sheets in a single layer. Spray WELL with olive oil. Cook until golden brown, about 20 to 25 minutes, flipping the onion rings over about half way through and re-spraying. Serve with dipping sauce. To make a dairy free buttermilk, Combine unsweetened milk of choice with 1 1/2 tablespoons lemon juice. Allow to sit for 10 minutes and proceed with the recipe. 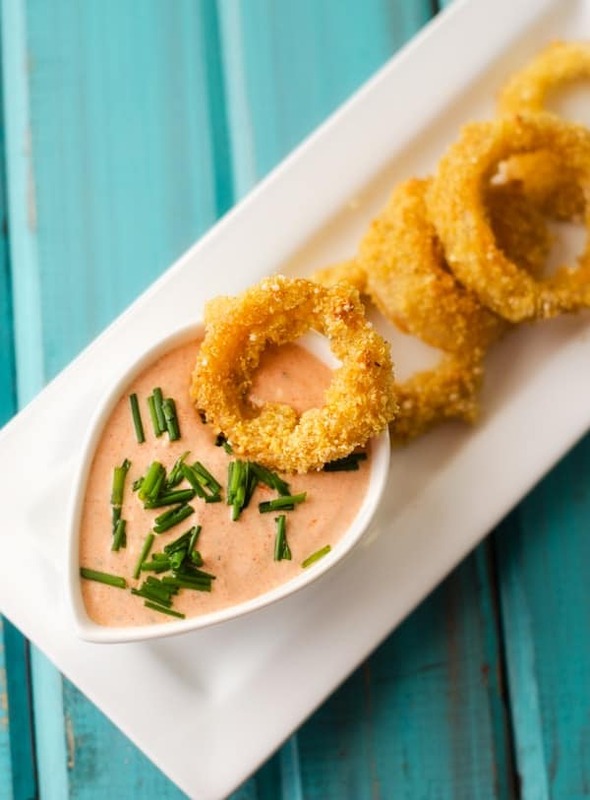 This Spicy Dipping Sauce is a delicious addition to these onion rings! Combine all ingredients in a small bowl. Refrigerate until serving. These were so good! Thank you. I cannot get quinoa flakes in the country where I live. What can be used as a gluten free substitute? Thanks.